The Ashton VSG cigar not only imparts the Ashton name, their years of dedication and exquisite tobacco but a refinement that makes them one of the most prized non-Cuban cigars on the market. 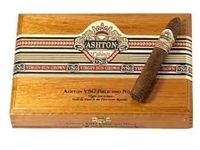 Ashton has taken 4 to 5 year old Dominican long-fillers that have been masterfully aged and blended to produce a smooth, rich and hearty flavor while adorning this cigar with a reddish, spicy and woody Ecuadorian sun grown wrapper that only enhances this cigars humidor appeal. From veteran to amateur - the Ashton VSG is a cigar that is guaranteed to deliver.